No self-respecting lady would allow herself to end up in Sarah Booth's situation. Unwed, unemployed, and over thirty, she's flat broke and about to lose the family plantation. Not to mention being haunted by the ghost of her great-great-grandmother's nanny, who never misses an opportunity to remind her of her sorry state--or to suggest a plan of action, like ransoming her friend's prize pooch to raise some cash. But soon Sarah Booth's walk on the criminal side leads her deeper into unladylike territory, and she's hired to solve a murder. Did gorgeous, landed Hamilton Garrett V really kill his mother twenty years ago? And if so, what is Sarah Booth doing falling for this possible murderer? When she asks one too many questions and a new corpse turns up, she is suddenly a suspect herself...and Sarah Booth finds that digging up the bones of the past could leave her rolling over in her grave. 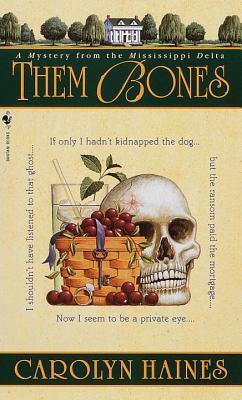 Them Bones by Carolyn Haines is a 1999 Bantam publication. Sarah Booth, from Mississippi, and born into old money, is haunted by her great, great, grandmother’s nanny, has defied southern tradition all her life. Now past thirty, unemployed, and most importantly to society- still single, she has returned to her southern roots, but finds herself in extreme financial straits. But, with her family estate on the line, she has begun to resort to desperate antics to keep her debtors at bay. When one of her friends hires her to churn up some dirt on the Garrett family, who is known for having more than their fare share of skeletons in the closet, Sarah discovers she has a few natural investigation skills. I don’t need to start another long running series, but I happened to stumble across nearly the entire series of books at my local used bookstore this past summer, and I’ve been itching to get started on it. This first book was not a disappointment and has me considering something I never ever do- binge read an entire series! Haines captures the peculiarities, atmosphere, and mentality of the deep south, perfectly. Sarah is open minded, big and soft hearted, but desperation has her doing things she never would have dreamed of. 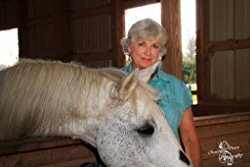 I enjoyed watching her deal with the conflicting emotions she wrestled with, with one foot firmly set in old southern traditions and the other foot firmly devoted to her determination to maintain her independence. The paranormal aspects are fun, and the light romantic tones added a nice touch, as well. But, the mystery is very interesting, and will expose a sordid family saga and finally pave the way for long overdue justice. I can’t wait to see how Sarah’s character develops over time and what kind of adventures she will get herself involved in next! Haines was honored with the prestigious 2009 Richard Wright Award for Literary Excellence. Haines was also 2010 recipient of the Harper Lee Award for Distinguished writing. Her novel BONE TO BE WILD was named best suspense for 2014, and the Sarah Booth Delaney series was also named best amateur sleuth. Two of the Sarah Booth books were included in the "Best 5 mysteries of the year" by LIBRARY JOURNAL.